187 labyrinths found. Showing 121-140. Sorted by country, state, city, then zip/postal code. Closely based on the Saffron Walden turf labyrinth, three times the size and with some changes to the path pattern - it's technically a maze! 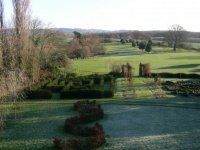 Planted in 2000, this labyrinth is in the grounds of Hellens Manor, a Jacobean mansion located in Much Marcle, between Ross on Wye and Ledbury. Open to the public on Wednesday, Thursday and Sunday afternoons from Easter until the end of September. Situated on a roadside verge between the villages of Dalby and Brandsby. Visit our website for further details - B&B also available in the historic 16th century Troy Farm farmhouse. Situated in a Private Garden at Troy Farm - please ask at the Farm for permission and directions. Unknown, probably late 16th or early 17th century? 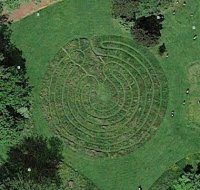 The mown labyrinth is on the picnic lawn, see map on Ness Botanic Gardens website. Always open during Botanic Gardens opening hours. 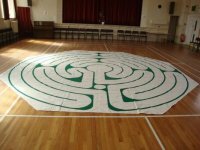 The labyrinth is available for indoor, facilitated walks by appointment and at scheduled events. I am a Veriditas-trained facilitator, with experience of working with groups and individuals in a range of settings. I am based in North East England, UK but may travel within UK by arrangement, to facilitate walks. NB: The labyrinth is not available for hire. Please contact me for initial enquiries, further information and discussion on facilitated walks. Photo taken on the day the turfing was finished. 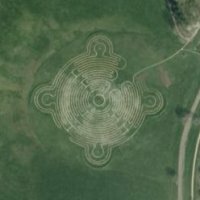 The labyrinth is situated on a farm that is used for Pagan camps. Camping is possible. There should generally be no problems with visiting. There is also a modern stone circle at the farm. We have built a representation of the original Shepherd's Race, or Robin Hood's Maze. 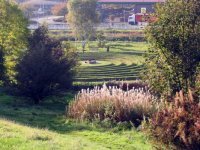 Perhaps the most curious and least understood ancient monument in Nottinghamshire, the original turf maze was near the Wells Road - but the debate over its origin and use continues. The Shepherd's Race was described as being 34-35 yards across, covering an area of 324 square yards, with a single path 535 yards long. The purpose of the maze seems to have been to run, dance or walk the path to the centre and back out - possibly without a pause. This was known as treading the maze and was popular at village fairs and other festivals. It could also be used for walking meditation. 7 circuit labyrinth, with optional direct path to centre, enabling groups to walk in, or out. Paths indicated by painted pebbles. From the church the garden is through the Car Park of the King's Arms across the road. A left turn off the Looe to Polperro Road and between Portlooe and Talland Bay. For retreat guests. Open for World Labyrinth Day. The volunteers on the final day of construction, 23rd April 2016. Follow the brown tourist signs labelled Brockholes, or with the Badger face logo, close to junction 31 of the M6, or on the A59 near the Tickled Trout Hotel at junction 31 of the M6. 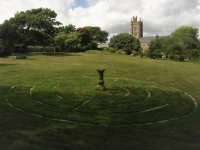 The labyrinth is located next to road at the far end of the access road to the car parking bays. There are retreats, workshops, guided walks set throughout the year, but do call for an appointment time to take a personal walk at times of need or interest. There is wheelchair access to the edge of the labyrinth, but I regret it isn't smooth enough on the labyrinth itself.